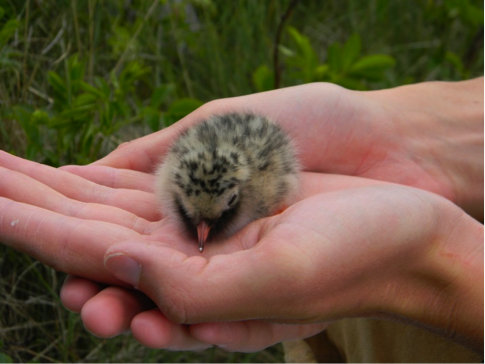 Earlier this summer, aquarists Austin Brayton and Jackie Anderson camped on remote islands in Maine to assist with Project Puffin, an Audubon Society project designed to restore populations of these clownish little seabirds. 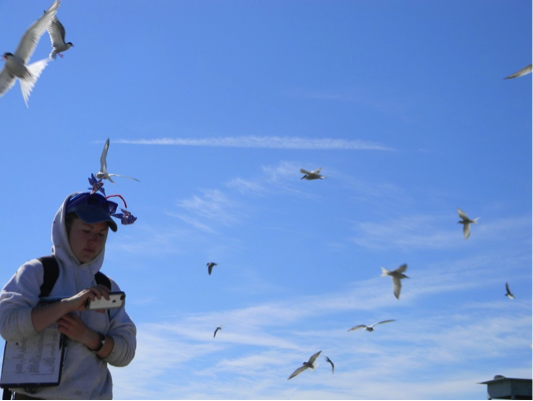 In this post, Austin and Jackie take us on surveys for terns. 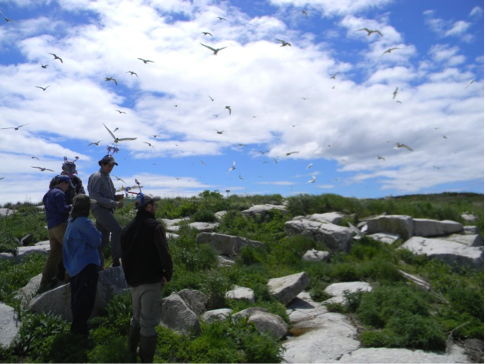 Today was a busy day on Seal Island as we performed a census to estimate the number of pairs of terns (Artic and Common) that nest on the island. We got a late start on the census as it rained heavily overnight and the vegetation was damp until 10 AM. We don’t enter the colony in damp cold weather because the eggs and chicks might get cold if the parents are scared away from the nests. Entering the tern colony is always an adventure as the terns are very aggressive, calling noisily and swooping down to try and peck your head, as well as pooping on you as they fly by. They have evolved this behavior to deter predators that could otherwise easily prey upon the tern eggs and chicks which are in very simple nests on the ground. You will notice the funny hats that we are wearing – having pin wheels or sticks attached to your hat helps keep the terns from pecking you directly on the head! After being pecked bloody one day, I upgraded my hat with a cardboard liner and two branching sticks duct-taped to the sides of the hat like antlers. 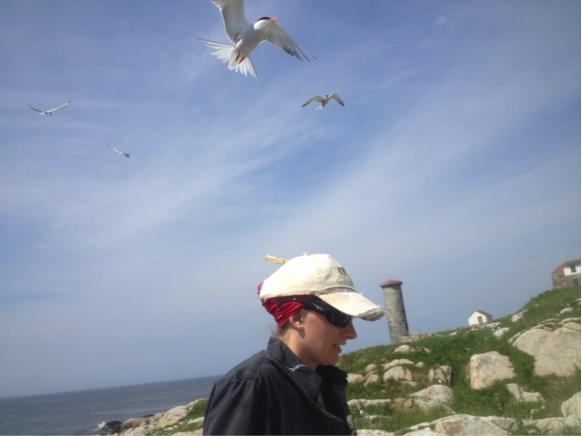 We spent all day performing multiple transects of the colony, walking side by side and counting the number of Arctic and Common Tern eggs (while being continuously dive-bombed by the adult terns). 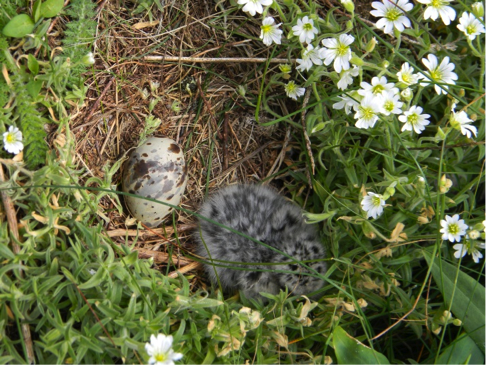 The best part was seeing the first day-old tern chicks. We also counted eggs in one plot going in one direction and marked their locations and then did a census of the same plot walking in another direction and counted the eggs again to see how many we missed and determine our margin of error. We missed 8 out of 200. Not too bad! Meanwhile on Matinicus Rock, we conducted our census over the next three days, June 17–June 19. We counted tern nests and how many eggs were in the nest. Additionally, we counted nests of laughing gulls, Eider and black duck. We divided the island into sections and walked up and down each section an arm’s length apart so that we didn’t miss anything.